((2 - 12)×10-20 J), the number of atoms in the nuclei (2 - 10) were determined. It was proved that nucleation take place on reduced sites of the oxidized tungsten surface. Within the range of studied diapason of current densities nucleis are forming on energetically similar electrode centers. The low value of the charge transfer coefficient (α = 0.26) indicates a weak effect of the double layer electrical field on the activation energy of charge transfer. Electrocrystallization in Nanotechnology, G. Staikov (ed. ), Weinheim: Wiley-VCH, 2007, 265 p.
Trofimenko, V. V., Loshkarev, Yu. M., Kovalenko, V. S. On separation and crystallization overvoltage transition in the electrolytic phase formation. Dokl. Akad. Nauk USSR, 1976, no. 227, p. 1181-1184. Trofimenko, V. V., Kovalenko, V. S., Zhitnik, V. P., Loshkarev, Yu. M. Unsteady nucleation kinetics galvanostatic electrolysis mode. Elektrohimiya, 1983, no. 19, p. 887-893. Kryshtop, I. G., Yurchenko, N. P., Trofimenko, V. V. Features of Zinc Monolayer Electrocrystallization on an Iron Electrode from a Zincate Solution. ECS Transactions, 2008, vol. 13, no. 10, p. 77–89. Fetter, K. Elektrohimicheskaya kinetika, Moskow: Himiya, 1967, 856 p.
Bockris, J. O'M., Nagy, Z., Damjanovic, A. On the Deposition and Dissolution of Zinc in Alkaline Solutions. J. Electrochem. Soc., 1972, vol. 119, p. 285-295. 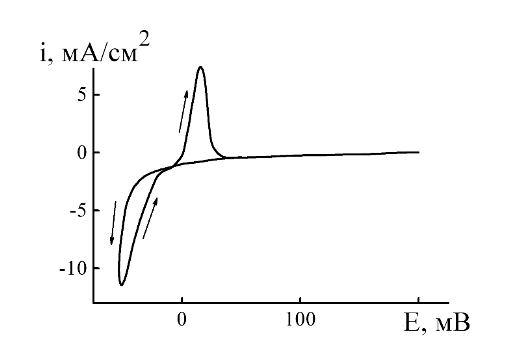 Gutsov, N. Kinetics of electrolytic phase formation in galvanostatic conditions. Izv. in-ta fizikohimiya B'lg. AN, 1964, no. 4, p. 69-87. Braynina, H. Z., Neyman, E. Ya. Tverdofaznyie reaktsii v elektroanaliticheskoy himii, Moskow: Himiya, 1982, 264 p.
Ponomarenko, E. A., Frumkin, A. N., Burshteyn, R. H. The dependence of the capacity of the carbon electrode in the isoelectric pH conditions. Izvestiya Akad. Nauk SSSR, himiya, 1963, no.11, p. 1549-1555. Krishtop, Yu. G., Trofimenko, V. V. Capacity isotropic pyrocarbon electrode during the nucleation of zinc from zincate solution. Ukr. him. zhurn., 2007, no. 73, p. 36 39.